Ramayana describes about 4 teams of Vanaras(humans with tails who wander in forest) going in 4 different directions to find King Rama’s kidnapped wife Seetha. Vanara king Sugreeva describes to team that travelled towards east, that first they will have to cross sea and would landup in Yava(Java) island. Then would would cross another island and reach a sea with red/yellow water (coral sea of australia). Then they would see the pyramid (today’s Gympie Pyramid near west coast of Australia). Through Sugreeva, writer Valmiki further describes that after crossing this huge island (Shalmali Dwipa/Austalia), they would see Mount Rishabha (ऋषभ) which looks like a ‘White cloud with a pearly necklace of waves rippling on the shores below‘. Near to that, they would spot the Sudharshana Lake with ‘silvery lotuses which have fibrils of gold‘ and where ‘kingly swans scamper around‘. 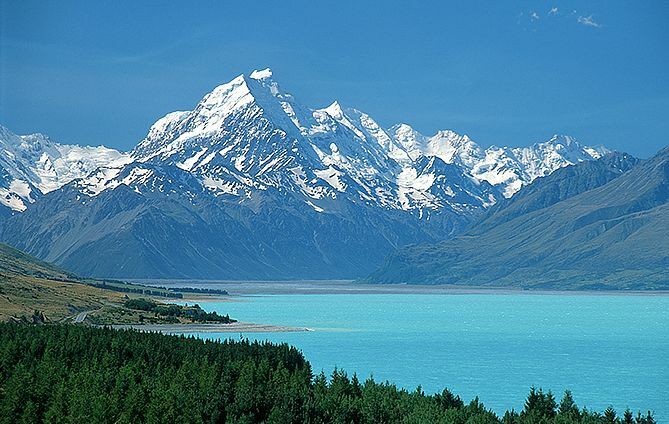 Valmiki could be referring to Mount Cook & Lake Pukaki of New Zealand, which match these descriptions. Sanskrit meaning of ‘Sudarshan‘ (सुदर्शन) is ‘beautiful to look at‘. Valmiki says that after crossing the island with these lakes, swans and beautiful mountains, one will have to cross a soft-water ocean which will be frightening to all beings. 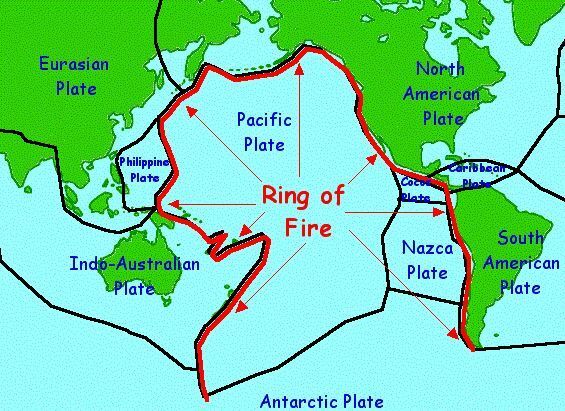 Ring of Fire is where a large number of volcanic eruptions occur in the basin of the Pacific Ocean. In the next verse Valmiki describes the magnitude of this ‘fantastic fire‘, that at the end of each epoch (Yuga) or era, that fire emerges forth with even more energy till all things, mobile or immobile, and the entire Creation becomes the fuel of this fire. Valmiki must be referring to the ‘Pacific Ring of Fire‘ as its in between these Australia-New Zealand and South America. Also the ‘Soft‘ ocean is the ‘Pacific‘ and Ferdinand Magellan in 1521 must have named it as Mar Pacifico in Portuguese, meaning ‘peaceful sea‘, as he saw the waters still with favorable winds to sail. Sugreevas further describes that after crossing this ocean, one would see Udaya Adri (उदय अद्रि) (‘Udaya’ = ‘Sunrise’ & ‘Aadri’ = ‘Mountain’) . According to him, day breaks on earth in the Udayaadri. Today, we consider Japan as the ‘Land of Rising Sun‘. But infact, at every geographical point on earth, darkness will fade away and day will break at a certain point of time on every day. Why was ‘Udayaadri (Mount Sunrise)‘ chosen as eastern point and why not some other place ? Ramayana’s Kishkinda Kanda, verses 4-40-57 & 4-40-58 give reasons why this point is chosen. Translation : On the apex of that Mt. Sunrise there is another pinnacle with one yojana width and ten yojana-s height named Saumanasa, which is completely golden and very firm. Translation : Earlier while treading the three worlds in the incarnation of Trivikrama, the Supreme God Vishnu made His first foothold on that pinnacle Saumanasa, and the second on the pinnacle of Mt. Meru to tread the heavens. Translation : The Sun is by far discernable in Jambu Dwiipa when he rises on this zenithal pinnacle Saumanasa, after he had circled the Jambu Dwiipa in a northerly route. Then he courses northerly on the other side of the globe via Mt. Meru in heavens at the other side of Jambu Dwipa, only to rise again on this Mt. Sunrise. As Jambu Dwipa, the subcontinent lies southerly to that heavenly Mt. Meru, and down East-South of Saumanasa, this subcontinent can happily see the First Sun, daily. This gives raise to the Indian name of India, that is Bhaarata, bhaa rataH (Sun, delights)…’ The place where the Sun delights firstly, that is Bhaarat‘. Andes could be a distorted version of ‘Adri’ over many years. Sugreeva further says to Vanaras that, while reaching Udaya-Adri, they will see Jaat-Shila-Rupa (Golden Rock Peak), etched on which is a ‘golden pylon resembling a palm tree with three branches with a golden podium ‘. Translation : On the northern province of that soft-water ocean there is a hugely enormous mountain named Jaataruupa-shila (Golden Rock Mountain), which glitters like gold and which spreads across thirteen yojanas. Translation : There you shall see then, oh, vanaras, the lotus-petal broad-eyed thousand-hooded serpent god in black clothing, namely Ananta, sitting on the top of that mountain and sustaining the earth on his head, who will be like moon in his brilliance and whom all beings hold in reverence. In ancient Indian texts the southern tip of South America (Chile) is ‘the head of the serpent called Ananta’, on which the earth rests (see the Ring of Fire starting at tip of South America in above figure). Translation : A golden pylon resembling a palm tree with three branches as its heads is established on the peak of that mountain as the insignia of that great-souled Ananta, and it will be lustrous with a golden podium. Translation : That pylon of palm tree is constructed as the easterly compass by celestials gods, and beyond that a completely golden mountain is there, namely the august Udaya Mountain, the Mt. Sunrise, beyond which it is all west. The pinnacles of Mt. Sunrise will be touching heavens for their height is hundred yojana-s and that divine mountain greatly glitters for it is completely golden, and it is pedestalled with suchlike glittering mountains. So, according to Ramayana, Peru is the land of the Rising Sun. 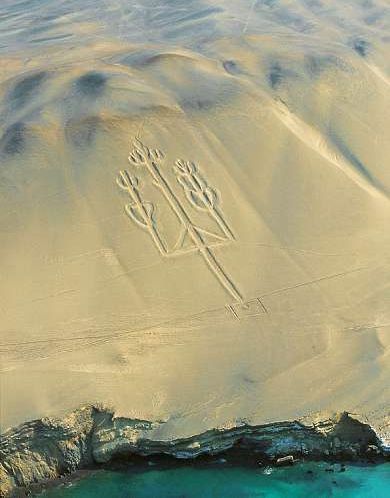 The Paracas Trident of Peru, is a geo-glyph in the Andes Mountains and is regarded in the native folklore as the ‘Lightening Rod‘ of God Viracocha, a pre-Incan Civilization God of Peru/Bolivia. 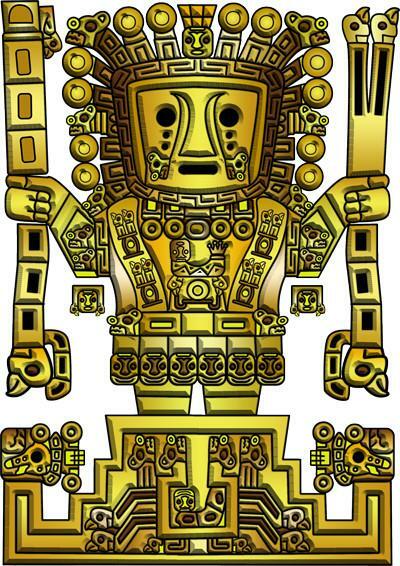 Interestingly, Viracocha was worshipped as god of the Sun and Storms and he carried thunderbolts in his hands. 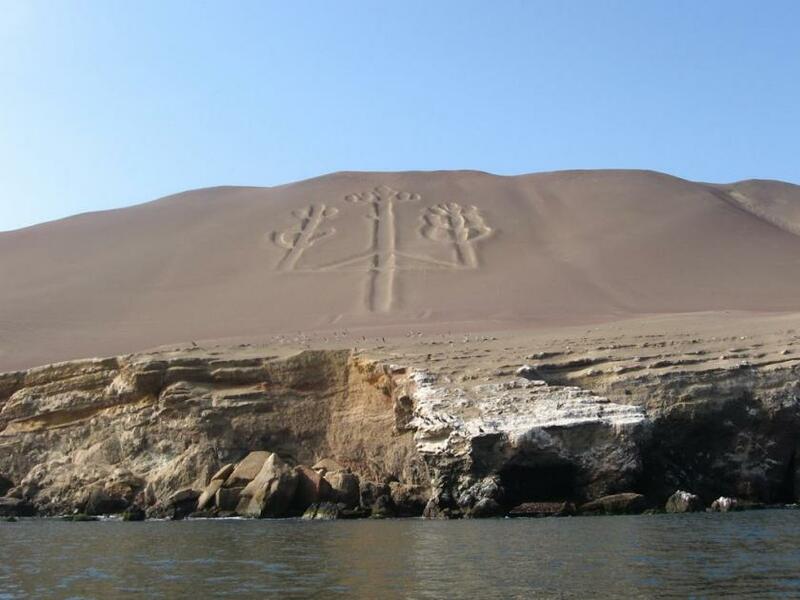 Paracas could be a distorted version of sanskrit word ‘Prakash‘ (प्रकाश्) which means light, lustre or brightness. Another word could be ‘parakash‘ (पराकाश) which means ‘distant view‘, as this trident could have served as a guiding beacon for ancient UFOs or ‘Vimanas’. The Trident in Hinduism represents Creation, Maintenance and Destruction. It also represents Time – Past, Present and Future. Virochana (Sanskrit: विरोचन), in Hindu mythology, was an asura, son of Prahlada (Sanskrit: प्रहलाद) and father of Bali. He is different from Viracocha (Wamana). Prahlada is son of Hiranyakasipu (who was killed by Vishnu as incarnation of Narasimha – Lion faced Human). (This explains partially, why Nazca lines are treated as King Bali’s ancient Airport. In the Atharva Veda Virochana was mentioned as the son of Prahlada. According to the Chandogya Upanishad , Virochana and Indra (who is said to be carrying Vajrayudha, a thunderbolt weapon) went to Prajapati (Brahma, the creator) to learn about the atman (self) and lived there, practising brahmacharya (self control) for thirty-two years. But at the end, he misunderstood Brahma’s teachings and preached the asuras (demons) to worship the sharira (body) as the atman. Thus, asuras started adorning the body of a deceased with perfumes, garlands and ornaments.